Best hostel on the island (I've stayed at a few) it might not have everything you want - like a pool table and giant lockers- but it has the friendliest staff - shout out to Roy ! Great open mic nights, cheap happy hours. Made me feel at home on the island 10/10 for atmosphere ! 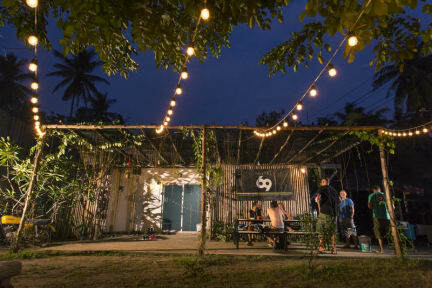 Nice social hostel, cool live music bar next to it, hammocks, good vibe, nice decoration. Nice host and very helpful and good advice, helped me and friends many times!!! Beware that the first dorm, basic one, might be noisy at night because the window opens on the social outside part. Clean, good vibes and nice staff. 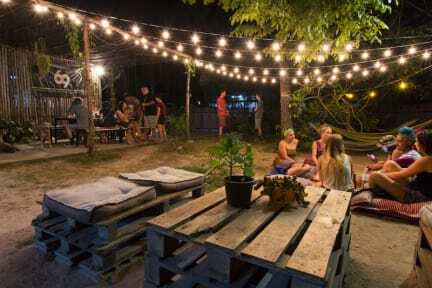 Great yard for chilling out with other travelers. Friendly atmosphere with kinda hippy vibe. Rooms pretty small, but beds are comfy. A bit far from the beach, but only 10 minutes walk from the pier. I was hoping for better here, seems like i missed any social atmosphere if it was there, the garden is right next to the main road so not really chill with the noise and exhaust fumes, the dorm is really small so i guess i was lucky to have only 2 other people staying there. The wifi also wasnt very reliable and staff /volunteers werent particularly friendly. Nothing really wrong, mainly just felt it was a bit overpriced, worth only 200 - 250 thb/night. The only good thing about this hostel is the nice garden area. I stayed in an 8 bed dorm which was nowhere near big enough for 8 people. There was absolutely no space to put bags so I ended up having mine on my bed which is unhygienic and inconvenient. The bathrooms always had a really horrible smell and there wasn't enough for the amount of people who had to share them. I washed a few pairs of underwear during my stay in the sink and was sternly told by a member of staff not to wash anything.